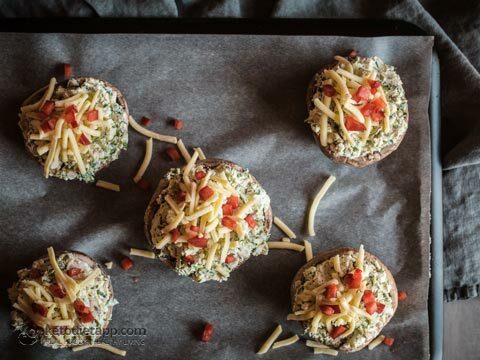 I first made these mushrooms when I was having stomach trouble and just couldn’t stand the thought of digesting meat. Now, trust me, this is not a usual position for me as I do love a good piece of meat. 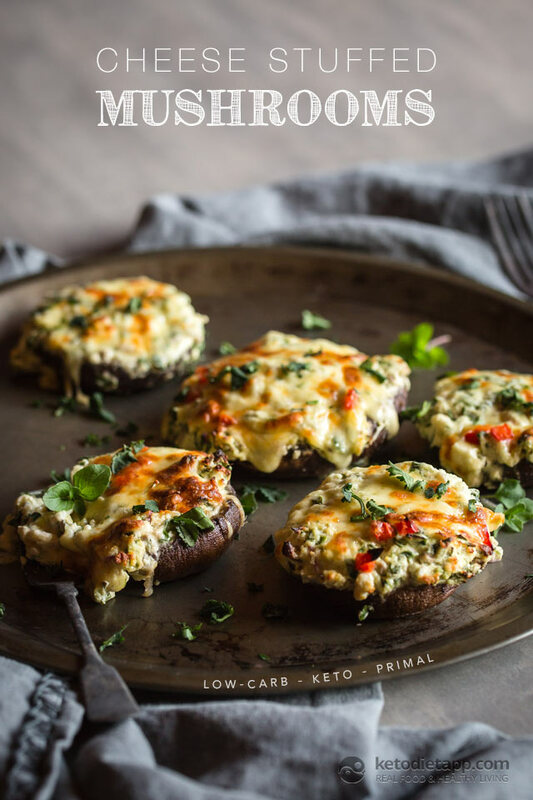 But these stuffed mushrooms are delicious and filling, without feeling heavy or hard to digest. They’re a great meat-free meal to add to your repertoire and can be served with vegetables or just a lovely tossed salad. The combination of creamy cheeses and tangy goat’s cheese is perfect against the classic combination of spinach and garlic. 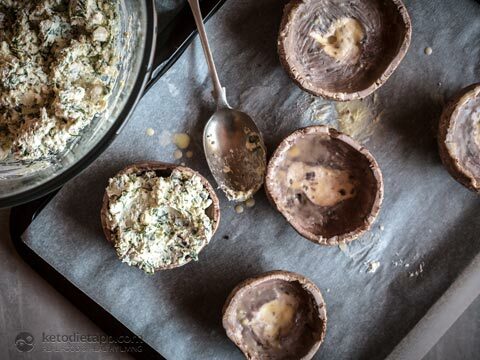 I would think that you could easily adapt the filling to suit your tastes, keeping within keto guidelines of course. Give them a try and see what you think. Note: Instead of frozen spinach, you can use 1 bunch of fresh spinach or 1 bunch of fresh kale. Preheat the oven to 180 °C/ 355 °F. Pat mushroom caps very dry with a paper towel. 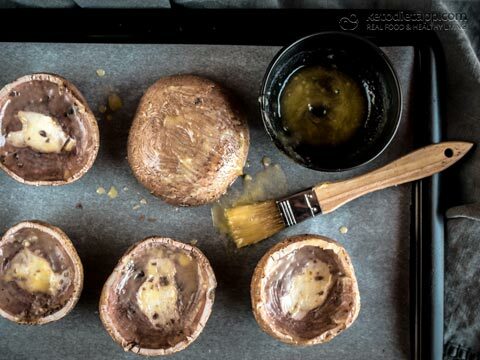 Brush melted butter all over the mushroom caps and place on a lined baking tray. Finely chop the red onion and spinach or kale and mix in a bowl with the cream cheese, ricotta, goat’s cheese, parmesan and garlic. Mix together well. Spoon into the mushroom caps. Really fill the caps, the mixture won’t run away so you can put a good pile of it in there. Top with just a sprinkle of cheddar cheese and the diced red pepper. Bake for 20 minutes until brown and bubbly. Serve with a sprinkle of fresh herbs of your choice. If you have any leftover filling, use it to stuff chicken breasts…yum! I want to thank you for the stuffed mushroom recipe, however, I found I couldn't print it. Is that on purpose, an upload error or maybe it's my computer. The print option is shown, but not available when opted. What's up? Hi Richard, I can see the print option - it's right below the list of ingredients. I hope this helps! Hi, is this recipe suitable for the fat fast? 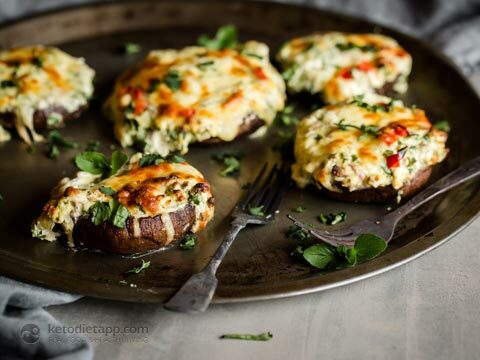 I wouldn't necessarily use it for the fat fast but here's a selection of suitable recipes (higher fat content): ketodietapp.com/Blog/Filter (one of them is pizza-stuffed mushrooms). I hope this helps! 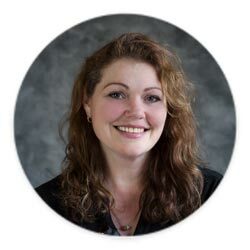 I'm new at the keto diet and love your recipes. I'm doing the vegetarian version. How do I determine the actual calories in your recipes? I'm trying to track everything I eat. Thank you for what you're doing to help people get and remain healthy. Thank you Toni! Calories are listed as "kcal" - I hope this helps! These are totally delicious and make a great dinner! So happy we have some left over for dinner tomorrow, great recipe! These look like so much fun. I love the fact that they're different than what you normally see but they'd be instantly appealing as well. The only catch I see is that people either love mushrooms or hate them. For the mushroom lovers, they are amazing. For the haters, well, perhaps not a good plan.